The Jewelry Store was started in the 100 Block of South Main Street in downtown Lancaster, SC in 1904 by D.L. Robinson. In the 1940’s, the store was moved to 223 South Main Street, Lancaster. D.L. Robinson Jewelers was a full service retail establishment selling diamonds, colored stones, gold, silver and platinum jewelry, China, Crystal, and Silver gifts, Bibles, Dictionaries, sewing needles, school supplies and a full bridal registry. They also had a jewelry repair service. In 1967, the Robinson Family sold the business to Mr. John W. Darden of Conway, SC and he changed the name to Darden Jewelers. Mr. Darden’s son, John W. Darden, III, ran the store in Lancaster until 1973 when he hired Jerry Garris to manage the store and Mr. Darden moved to Conway, SC. Jerry Garris, a Lancaster native, managed the Jewelry store and was trained in all aspects of Jewelry Repair and completed GIA Diamond and Colored Stone Courses. In 1980, Jerry and Mary Garris purchased the store from Mr. Darden and changed the name to Garris Jewelers, Inc. The store was a full service jewelry store with a Bridal Registry, which included China, Crystal, Silver and Gift Items. 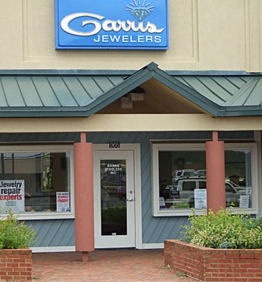 Garris Jewelers has kept the reputation of carrying fine quality jewelry and gifts and expert repair and design service. In 1985, Larry Garris, Jerry and Mary’s son, started working at Garris Jewelers learning repair work and sales. In 1986, the store was moved to West Meeting Street and also joined the Independent Jewelers Organization (IJO), the largest jewelry buying group in the world, to be able to get the best values for our customers. We travel to Antwerp, Belgium, the Diamond Capital of the world, to get the most beautiful diamonds for our customers. In 2002, Garris Jewelers moved to 302-B North Main Street in Lancaster, approximately 3 blocks North of where the Jewelry Store was originally started 98 years earlier. The photo on the right shows the current 965 N Main St. location. Jerry Garris retired in May 2005, leaving the store in the capable hands of Mary and Larry Garris. In August of 2008 Garris Jewelers moved further up North Main Street to the Lancaster Square Shopping Mall located where Highway 521 (N. Main St) and Rt. 200 merge. The new address is 965 North Main Street, Lancaster, South Carolina. Mary retired in October 2016, leaving the store in the capable hands of Larry and Annette Garris as well as their daughter, Tiffany Conrad. Garris Jewelers is still a full service Jewelry Store for Lancaster and surrounding areas. Our goal is to supply quality jewelry, diamonds and colored stones with unparalleled repair service. We are members of the Independent Jewelers Organization (IJO), Lancaster Chamber of Commerce, Lancaster Downtown Business Association, South Carolina Jewelers Association, the Masonic Fraternity and the Order of the Eastern Star.